Montgomery Planning created this terrific, short video that shows the wonder of the White Flint Placemaking event last week. Montgomery Planning, Better Block, and Randolph Civic Association worked hard to successfully bring the community together at this joyous event. Grab your kids and grab your friends for a COMMUNITY BONFIRE starring everyone's favorite treat, S'MORES! This fun neighborhood event is Saturday, November 10 from 4 to 6 pm at Wall Park next to Shriver Community Center. We'll have all the fixins' for yummy, gooey s'mores made around a dancing bonfire. Talented musicians from Strathmore will provide the music for this wonderful afternoon of community fun. Kuya Ja’s fleshes out a Filipino feast: Slow-cooked pork belly is the star at this Rockville storefront, but it’s far from the only attraction. Of the many advancements on the dining scene in recent years, the rise of Filipino restaurants has been among the most exciting, a trend famously jump-started by Bad Saint in the District three years ago and nurtured since by upstarts including Kuya Ja’s Lechon Belly in Rockville. The name of the suburban storefront tells you what to order: slow-cooked pork that gets its savor from lemon grass, pineapple and garlic; its sound effects from mahogany skin that breaks apart like glass. Add to the beast some pickled papaya slaw and rice with toasted garlic, and you can believe co-owner Javier Fernandez when he says customers come from as far away as New York. The only thing I question is where the fans sit. Twenty-three seats translate to lines at both lunch and dinner, and lechon is by no means the sole attraction. The piping hot lumpia are the best around, chicken adobo pulses with soy sauce, garlic and vinegar; and desserts, from the chef’s sister’s nearby bakery, run to colorful shaved ice, cupcakes and rich custards. Some of the combinations may test your sense of ad­ven­ture; sisig is a stir-fry of pigs ears, headcheese, Thai chile, garlic and cane vinegar — funky, fiery and fabulous, you should know. Starting this month, Fernandez is rolling out a reservation-only dinner on Tuesday nights, at which diners will eat the chef’s food off tables covered in banana leaves, with their hands. Break out the moist towelettes and open wide. 5268-H Nicholson Lane, Rockville, Md. More than a thousand folks turned a parking lot into a park and personified what community is all about. The White Flint Placemaking Festival was an unmitigated success! Congratulations to Montgomery Planning, Randolph Civic Association, A Better Block, and everyone else who made this a unique and a major success. Enjoy these photos from this very fun, very wonderful event. A fun block party this Saturday at NoBe Market! CapMac and Mercado will be serving up some delicious food, or enjoy the Seasons 52 patio with a delicious beverage, or a latte at Starbucks! No worries. Be Happy. See you at NoBe Market! 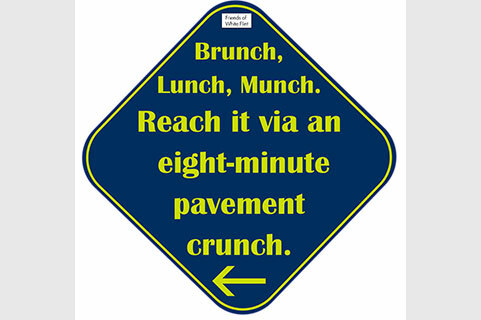 Did you see this article in Bethesda Beat about the Pike District new placemaking signs? Check it out by clicking here. If someone gets lost in Montgomery County’s Pike District, an area nonprofit this week made it a bit easier to find what they’re looking for. On Wednesday evening, members of the Friends of White Flint hung 30 signs along Nicholson Lane, Executive Boulevard, Old Georgetown Road, Woodglen Drive and Marinelli Road directing pedestrians and bicyclists toward places such as restaurants, bars and parks. The grant-funded markers are a signage system intended to highlight area amenities. The grant was awarded by the Bethesda Chevy Chase Regional Services Center. Are you seeing our new wayfinding signs around the Pike District? Thanks to a grant from the Bethesda-Chevy Chase Regional Services Center and some intrepid volunteers, the Pike District has wonderful new wayfinding signs to guide and entertain. The fun signs, created by the Friends of White Flint, are spread around the White Flint area. Have you seen them all? Have you taken a selfie with any of them? Be sure to tag the Pike District when you post them!